2018 is the 50th anniversary of FEBS Letters! In 1967, during the 4th FEBS Meeting in Oslo, the Secretary General of FEBS presented the idea of launching a journal for the rapid communication of short reports in Biochemistry, Biophysics and Molecular Biology. 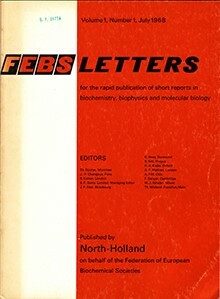 The first issue of FEBS Letters appeared just one year later, in July 1968. Since then, the journal has published over 45,000 articles. 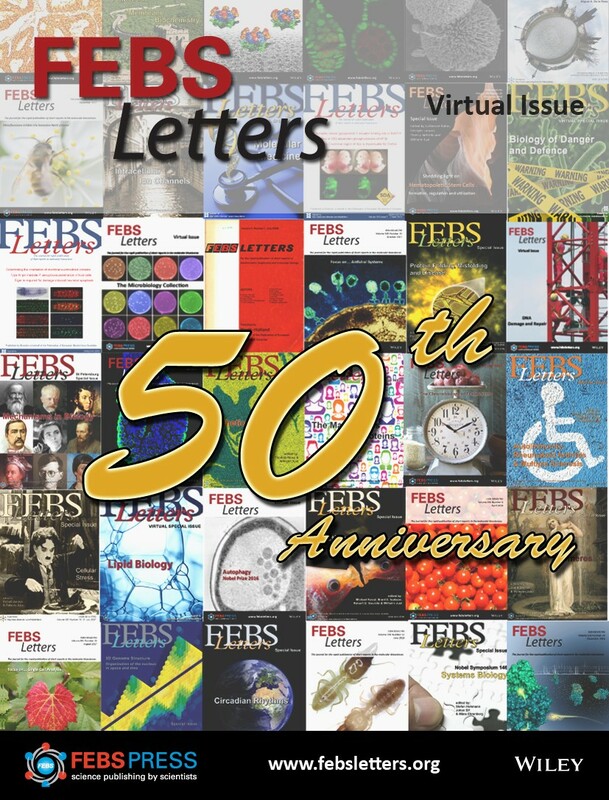 This year, we celebrate the 50th anniversary of FEBS Letters, and its success as a journal that has actively contributed to the dissemination of quality science in a historical time when the molecular biosciences underwent an unprecedented exponential growth. We are very excited about our golden jubilee, and we are working hard to make this year special in every way. To begin with, we felt FEBS Letters should dress up for the occasion by publishing exceptional issue covers throughout the year. We have therefore initiated a Cover Contest for all of you who feel inspired. You don’t need to be an author to participate. If your image is published on our cover, we will send you a poster-size printed copy of the issue cover. In addition, in December 2018 we will reward the creators of the 3 best covers of the year with a prize of 100€ each. So join us in the celebration and get creative! In addition, to showcase the quality of our content, we selected 50 outstanding research articles published in FEBS Letters over the last 50 years, which have become landmarks in the field of Molecular Biology. We have collected them for you in a Virtual Issue which we feel is of historical value, besides being of scientific interest. You will find among them one of the articles that earned Yoshinori Ohsumi the 2016 Nobel Prize in Physiology or Medicine; the identification of the human estrogen receptor ERβ; the discovery of MDM2 as an E3 ubiquitin ligase for p53; the cloning of green fluorescent mice; or Sanger’s invention of thin acrylamide gels for DNA sequencing, just to name a few. Last but not least, please mark your calendars, as we are organizing a symposium to celebrate the 50 years of FEBS Letters. We invited twenty exceptional speakers, picked among the authors of outstanding articles published in FEBS Letters, who will come to talk about their most recent findings, as well as the past, present and future of their field. 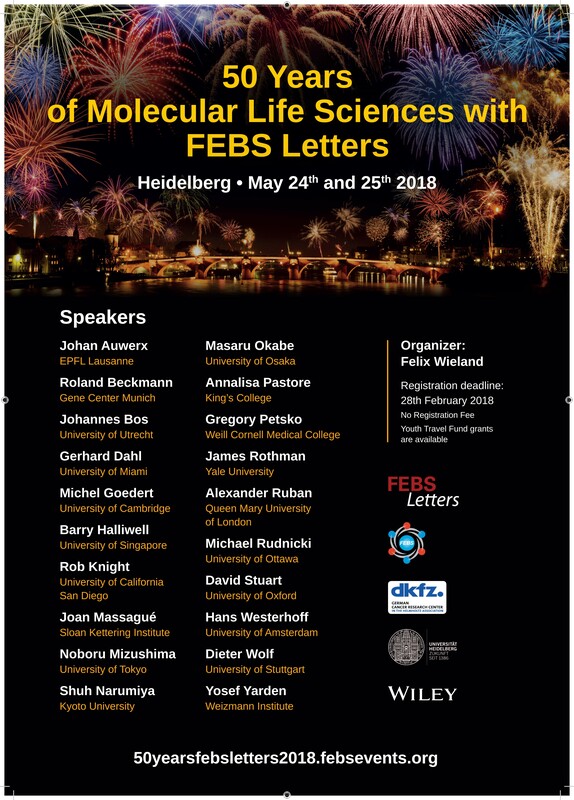 The symposium “50 Years of Molecular Life Sciences with FEBS Letters” will be held in Heidelberg on the 24th and 25th of May 2018. The scope of the symposium is very broad, and particularly suited to scientists at an early stage of their career, although we are sure that established researchers will find it interesting as well. We invite everyone to register – there is no registration fee! Finally, to conclude in a festive spirit, an end of symposium party will close the celebrations.